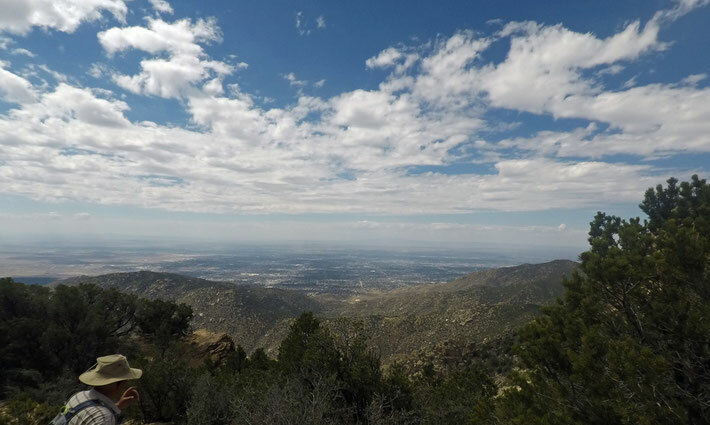 One way to explore the southern Sandias is to begin hiking up the South Crest Trail from its south end. There are two ways to reach the crest of the Sandias from this direction, but neither route is ideal. I’ll describe the South Crest Trail route first and will add my comments and directions for the CCC Trail at the end. Both options begin at the south trailhead for the Crest Trail, in Tijeras Canyon. To reach the trailhead, head east on I-40 from Albuquerque. Take the Tijeras exit and where the exit lane splits, take the right fork. About 300 meters later, where the exit lane curls right, take a left (north) turn and pass under I-40. As soon as you’re through the underpasses turn right, then immediately take the left fork. Follow Arrowhead Trail, which becomes Thunderbird Trail, and park at 35 deg. 5.375 min. N, 106 deg. 23.479 min. W.
The Crest Trail (130) trail heads up Hondo Canyon. At 35 deg. 5.700 min. N, 106 deg. 23.577 min. W, a spur trail heads to a small travertine waterfall fed by a spring. (In September 2018 the waterfall was barely a trickle.) Most people use the spur trail to visit the waterfall, which is an 80 meter stroll upstream from the turnoff. They then use the short unofficial trail to the right of the waterfall to rejoin the Crest Trail. You can instead stay on the Crest Trail, and take three times the distance to reach the same point. If you’re looking for a short (under 1 mile) jaunt to a shady and often watery place, the wooded area just above the falls is a good destination. Beyond there, it’s time to gain elevation. At 35 deg. 5.851 min. N, 106 deg. 23.836 min. W, the Lower Faulty Trail (195) comes in from the right (north). At 35 deg. 5.931 min. N, 106 deg. 24.354 min. W, the Upper Faulty Trail (195A) comes in from the right (north). The Lower and Upper Faulty Trails join north of the Crest Trail, so it’s possible to hike north along one and south along the other, for a mostly wooded, in-and-out-plus-loop hike of 4 miles. Here I’ll assume that your goal is to reach the ridge line of the Sandias, which means that you face a dilemma. If you continue on the Crest Trail, it takes a lot of walking to get to the ridge crest. This part of the trail features the only switchbacks that I ever thought were too gentle! The other option is to use the CCC Trail to head straight up to the ridge line, as I describe below, but it’s not something I recommend. Instead I suggest that you stick to the Crest Trail, assume that your goal is take a stroll in the mountains, and be pleasantly surprised when you finally wind up on top of the ridge. That happens at about 35 deg. 5.688 min. N, 106 deg. 25.706 min. W.
Once at the ridge line, the trail heads northward. At 35 deg. 5.972 min. N, 106 deg. 25.545 min. W, South Sandia Spring features a feed pipe and wildlife trough just off the trail to the right. In September 2018 the spring was bone dry. At 35 deg. 6.659 min. N, 106 deg. 25.628 min. W the Embudito Trail (192) comes in from the left (west). By this point you’re in pleasant mountain meadows, with a young aspen grove nearby. It’s a good area to have lunch before heading back down. The ambitious will press on, to South Sandia Peak roughly a mile beyond. Near the top, oak scrub is common. The Crest Trail can be seen to right of center. The pile of stones marking the lower end of the CCC Trail. Behind the pile, the Upper Faulty Trail disappears into the trees. In September 2018 I finally tried the CCC Trail. If I never do it again, that’s fine with me. The trail begins at the junction of the South Crest Trail and the Upper Faulty Trail and mostly goes straight upslope to the ridge line—no switchbacks. The route was used by the teenagers and young adults of the CCC, who were plenty tough, but weekend warriors will find it a challenge. If you go up the trail it’s better to be young and strong. If you use it to head back down, be sure your knees are still under warranty. Going up the trail on a hot September day, I quickly reached the point where the hike felt like work, not fun—violating one of my key principles for hiking. There are views along the trail, once you get high enough, but otherwise the aesthetic rewards for all that toil and sweat are limited. The one compelling reason for doing this trail is that you want to reach South Sandia Peak and have the stamina to take advantage of a steep shortcut. To start up the CCC trail, head north on the Upper Faulty Trail from its junction with the South Crest Trail. Twenty meters later you’ll encounter the low but obvious rock pile that marks the start of the CCC Trail. Make a left turn and start uphill. The CCC isn’t an official trail and it’s unmarked, so hikers follow a beaten path. Sometimes that path almost fades out, especially where it crosses bedrock. Those lacking pathfinding skills may have trouble staying on the trail, so I’ll provide several intermediate waypoints below. The CCC Trail proceeds up the middle of this photo. Not very obvious, is it?